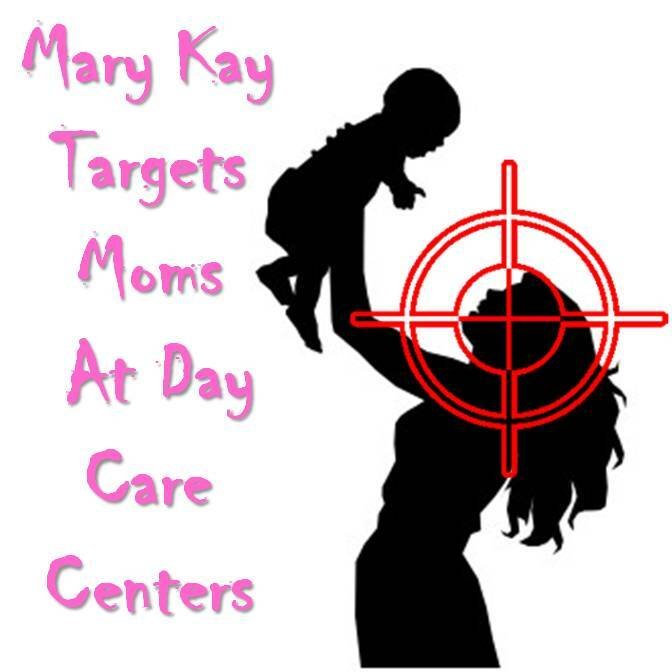 Mary Kay Predators Target Moms At Day Care Centers – F.A.C.E.S. Can you imagine you or your spouse arriving at your day care center–the place where you entrust those to care, to feed and to keep your child safe–only to be accosted by a woman giving you a bag of “goodies” and wanting to “enroll you into a contest” so she can get your private information? That’s one of the more insidious predatory tactics Mary Kay consultants, Directors and higher ups do–target working moms at the very places they leave their children–the day care center. What’s worse is that, all-too-often, the Mary Kay predator has used (or unwittingly duped) the day care center’s director into helping the predator make you (or your spouse) a target. The only real purpose Mary Kay predators show up at children’s day care centers is not to pamper moms, but to target them. While she is looking for customers, the real reason is to find recruits and, to the Mary Kay predator, the day care center is a target-rich environment. Working mothers are generally tired at the end of the day, many would rather find ways to be at home with their children (instead of working outside the home), and with the “promise” of extra income, working moms fit the perfect profile for Mary Kay. Below are several (of many) of the Day Care Scripts that Mary Kay’s sales force uses to get their foot in the door to day care centers and into your family’s life. This is the script that National Sales Director Margaret Bartsch posts on her website. Hi, is the director available? My name is ________________ and I’m an executive with Mary Kay in the local area. I’m calling today because I’d like to ask permission to bring free goodie bags for the staff in appreciation of all the hard work they do for our children and I am honoring working moms. The goodie bags are filled with pampering products for the moms and staff to try and sample products to take home with them. All we’ll need to do to get you set up is to pick a date that works well for you. I will stay to help pass them out. All I will need to know is a head count of all of the moms and staff you would like to open this up to, and I will bring enough goodie bags for everyone to enjoy. I will also bring a sign up sheet for a $100 gift basket that we will be giving away at the end of the month as a grand prize. I can also bring full size products for them to try on their breaks if you would like. Note that the NSD’s script does several things: First, she talks about “our” children, regardless whether she has any children of her own in day care. Second, she moves from “staff” to “working moms” in the same sentence. Then, in the second paragraph, she talks about “pampering” and, instead of just dropping them off, offers to stay and “help pass them out.” Lastly, she quickly moves to the “grand prize”–a $100 gift basket (of Mary Kay makeup)–to collect names and phone numbers. Here is another Mary Kay script to target moms at day care centers. However, this day care script goes even further. If you (or your spouse) are working and have a child in day care, you may wish to forewarn your day care center’s director to beware of the tactics Mary Kay predators use to target moms (and their children).